The Travemunde to Liepaja ferry connects Germany to Latvia and is operated by Stena Line. 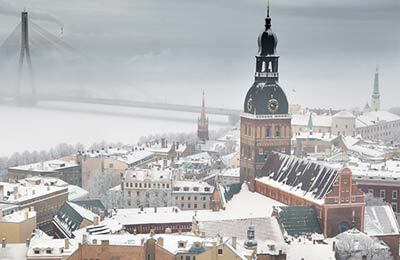 The best price found by our customers for Travemunde to Liepaja recently is £625. Book a Travemunde to Liepaja ferry today with AFerry. Just use the form above and choose the route that you want. If nothing appears automatically, start typing Travemunde. You can also type the country or even the name of the ferry company you are interested in. When you have the route that you want, choose single or return and all the other options you want. If there is more than one ferry company operating on the Travemunde Liepaja route we will show you all the ferry companies, to make sure you get our best price. We'll also show you any routes similar to Travemunde to Liepaja so you have the complete picture when making your booking. And of course you'll also see a range of times just in case it's a bit cheaper earlier or later than your preferred booking time. Once you've chosen your perfect sailing and have made your booking we'll email you your booking confirmation for your Travemunde to Liepaja ferry. The majority of tickets have instant confirmation. Below you can see the ferry company or companies that sail on the Travemunde to Liepaja route and the journey times. You might also see some recent prices our customers have found. The best way to find a cheap Travemunde to Liepaja ferry though is to use the form above today to see all of our possible choices. With AFerry we always give you our best prices for ferries from Travemunde to Liepaja. No matter which page you book from we always include all our special offers. And there is no need to look for a discount code. If we have an offer available, your ferry price will include the reduction or offer. There's no need to look at other websites. If you're not sure if the Travemunde to Liepaja route is right for you or you can't decide between ferry companies, if there is more than one, you might also find it useful to read any reviews we have available. We ask all our customers to send us reviews for Travemunde to Liepaja ferries. Remember though, that the earlier you book, the cheaper prices normally are. So don't spend too long deciding! Travemunde to Liepaja is a popular route, so we advise you to book as soon as possible. Set within the region of Lubeck, Travemunde is an old German seaside resort and is still very popular with families. Travemünde offers you everything: The great outdoors, romance, culture and sports. You can take tours on a bicycle or in a horse-drawn carriage, take a stroll on the beach promenade, go shopping on the Vorderreihe or enjoy the beach which is 4.5 kilometers long and wider than any other beach on Germany's Baltic coast. There is plenty to see and do in Travemunde, from visiting the old sailing ship Passat to the annual sand monument event. Travemunde also boasts many interesting museums, such as the St. Anne's Museum, which is a former convent housing art and home furnishings from the middle ages until 1800; the Museum of Natural History and Environment; and the Puppet Theatre and Museum. Leipaja is a medium sized port equipped for passenger and freight ships and is an excellent entry point for West Latvia with excellent road and rail connections to the rest of the country. It is also a large and cosmpolitan city on the Batlic coast. Here, you'll find wooden houses, Art- Nouveau buildings as well as Soviet-era apartments. There are also green parks dotted throughout the city. Liepaja is known in Latvia as "The city where the wind is born" possibly because of the sea-breeze and there is an anthem dedicated to the city with the same name. Nearby the city, today you can find the biggest wind power plant in the country - confirming just why the city has such a windy reputation. Tourists might be interested in visiting the city centre with its many beautiful historic churches or the Seaside park with white sandy beaches. 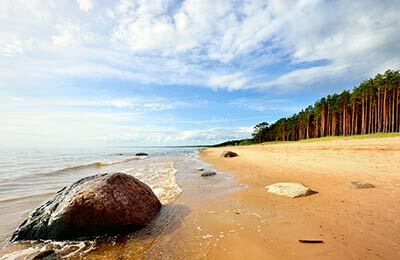 The northern suburb of Karosta is also well worth a visit. This was a secret military encampment but now is a major tourist attraction and a rare glimpse into Lavia's communist past. Other areas of interest for tourists are Vecliepāja, Ezerkrasts, which is close to Liepāja lake and the Karosta beaches with their picturesque blasted forts.